In four seasons, right-hander Al Schroll pitched for four major-league ball clubs – the Red Sox and Twins in the American League and the Phillies and Cubs in the National League. He won a total of six games and lost nine. Schroll was lucky to be alive, not to mention making the major leagues; a serious lung operation was required at the age of 15. He was laid up with pneumonia He regained his health, and then some, starring in four sports in high school—baseball, basketball, football, and track. He came from a family of athletes. His father, Charles, had reportedly caught for Memphis1 and his older brother Bill had played professional football for the Buffalo Bills, Detroit Lions, and Green Bay Packers from 1949-51. Al’s own physique became so robust that he got the nickname “Bull” – he is listed as having been 6-foot-2 and 210 pounds. Red Sox scout George Digby saw him pitch in an all-star game in New Orleans, and signed him up.6 The 6-foot-2, 210-pound right-hander started his professional career with the 1951 San Jose Red Sox (Class C California League), but he was over-matched. In 20 games (15 starts), he was 2-7 with a 5.47 earned run average. In seven games for the Class D Marion (Ohio) Red Sox, he was 4-2, 3.08. In 1952, he trained with Boston’s Birmingham ballclub. He was 0-2 for San Jose, but spent most of the season with Roanoke in the Class B Piedmont League. There, he had an unfortunate won/loss record of 3-11, but an ERA of 4.01 that showed some possibilities for a 20-year-old. One of the defeats was his August 13 three-hitter which he lost, 2-0, to Norfolk. He was 2-2 in Class A, with Albany. Schroll stayed in one place for all of 1953, pitching for Eddie Popowski and the Greensboro Patriots (Class B Carolina League). He was 15-12 (3.64), somewhat unaccountably better in relief than as a starter as the season began. Through May 26, he was 3-0 from the bullpen, but without a decision in four starts. His 15 wins led the Patriots. On June 11, 1954, he married Frances N. Thompson. Within a year or two, they had a son, Mike. Another son followed and two daughters. The marriage later ended in divorce. During the spring of 1956, Schroll reported early and got in some extra work, but he battled soreness in his right shoulder, finally receiving a cortisone shot in late February. He was placed with the San Francisco Seals in April and was 0-3, 3.68, but then was sent to pitch for the Oklahoma City Indians (in the Double-A Texas League), where he was 6-11 (4.63). Despite a disappointing couple of seasons, the Red Sox weren’t ready to give up on him yet, and he was recalled to the major-league roster at the end of September, but did not appear in a game. It’s understandable that Schroll was discouraged, and in early 1957 said, “If I find that my arm bothers me when I throw hard, I’m going to go out and get a lunch pail and go to work.”10 He’d pitched in Puerto Rican winter ball, though, and his arm had held out. Schroll did hit well as a pitcher, batting .273 over the course of his professional career (based on incomplete records). On March 18, 1957, he was optioned back to the Seals. He pitched for San Francisco, not recording a decision, then was 5-5 for Oklahoma City, and ultimately was 9-9 for the Double-A Dallas Eagles (where he was sent after the Sox purchased the contract of Dallas pitcher Murray Wall from the New York Giants). Schroll was again recalled to Boston at the start of September, but remained on the bench. It was back to Sarasota for spring training with the Boston ballclub once again in 1958. Schroll decided to forego playing winter baseball and may have benefited from giving his arm a rest. He’d impressed manager Mike Higgins with his determination, and his arm was finally in good shape in the springtime. The Boston Globe’s Hy Hurwitz wrote, “He wasn’t given a chance of making the varsity but now he’s much in the running.”14 This year, he made it to the majors. 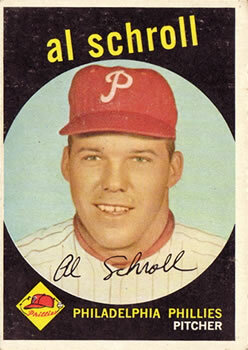 Schroll’s big-league debut came at Washington’s Griffith Stadium on the afternoon of April 20, 1958. The Senators got off to a 5-2 start against starter Frank Sullivan and reliever George Susce. Gene Stephens pinch-hit for Susce in the top of the fourth, and Schroll was asked to take over on the mound. He faced three batters in the bottom of the fourth and three more in the bottom of the fifth, retiring them all in order. He was himself removed for pinch-hitter in the top of the sixth, but had thrown a perfect two innings. Only one ball left the infield. The next day the Red Sox were at Yankee Stadium and down, 4-0, after five innings. Higgins asked Schroll to take over for starter Willard Nixon. He retired the side in the sixth, but walked the leadoff man in the seventh. No worries; he got Mickey Mantle to fly out to left and then retired the next two Yankees on groundouts. Only Mantle’s ball had left the infield. At Fenway Park on April 26, Schroll was brought in a third time. He gave up a single to the first batter he faced, then disposed of the next three for a scoreless fourth inning. But in the top of the fifth, the Senators got to him for three more hits and three earned runs. He pitched twice more, giving up two runs in three innings on April 30 and retiring all three batters in one final inning on May 12. He was then sent to Minneapolis on May 15. In 29 games (20 starts), he was 8-8 (3.70) for the Millers. He’d been without a decision and a 4.50 ERA for the Red Sox. On October 2, it was reported that Schroll had been obtained by the Philadelphia Phillies for an undisclosed sum.15 He pitched in three April 1959 games for the Phillies and got his first major-league win, although in the worst game he pitched – he gave up six runs in seven innings of relief, but was the beneficiary of 14 runs scored against Cincinnati. He lost a game in relief on April 24. On May 7, the Phils returned him to the Red Sox. It was reported that the sale from October had been a conditional one, and Philadelphia was not satisfied. Sent to Minneapolis, Schroll was 3-4 (4.01) there, but was brought back to Boston to pitch on July 19 against the Indians. Schroll’s first major-league start was for the Red Sox in Kansas City on July 25; he worked five innings, giving up two runs, and bore a loss. Four days later, though, he threw a complete-game six-hitter, winning, 4-1, and evening his record at 2-2. By season’s end, his combined record with Boston and Philadelphia was 2-5. All told, he appeared in 14 games for this second stint with the Red Sox (five starts), with a 4.70 ERA. On December 1, he was traded for a legend – Bobby Thomson. After winning the 1951 pennant for the New York Giants with his famous “shot heard ‘round the world” home run in the third game of that year’s playoff against the Brooklyn Dodgers, Thomson had later played for the Milwaukee Braves and Chicago Cubs, and the Cubs traded him to Boston for Schroll. Boston saw Thomson as “an understudy for Ted Williams” and “insurance” in case Jackie Jensen decided to retire.16 The Cubs, of course, were hoping to see Schroll blossom. He was still 27 years old at the time, due to turn 28 just before the 1960 season got underway. Though he had several bright spots in spring training, once the regular season began, Schroll didn’t do much for the Cubs. He faced 15 Cardinals batters on April 29 in St. Louis, walking four and giving up three hits and three runs in 2 2/3 innings of relief. And on May 1, still in St. Louis, he faced one batter and walked him. He was sold outright to the Houston Buffs on May 11, and he spent the rest of the year (8-10, 3.04 ERA in 25 games, all but four of them starts) in the American Association. Schroll was 1-2 (5.82) for Houston in the first part of the 1961 season, then found himself with Syracuse, where he was 6-3 with a very good 2.22 ERA. The major-league Minnesota Twins bought his contract on July 27, and Schroll was back in the big leagues. He worked an even 50 innings in 11 games for the Twins, eight starts, and put together a 4-4 record. His earned run average was 5.22. These were Schroll’s last games in the major leagues. His final victory was on September 27, when he had a no-hitter going through eight innings against the Cleveland Indians. The first batter in the top of the ninth, pinch-hitter Don Dillard, singled. Schroll walked the next two batters and then gave up a bases-clearing triple to Tito Francona, who scored on a groundout by the next man up. Schroll still held a six-run lead and retired the final two batters. In 1962 and 1963, Schroll remained in the Twins minor-league system. He was 12-13 (3.54) for Vancouver in the Triple-A Pacific Coast League in 1962, and was 10-10 with a 3.81 ERA in Double-A ball, pitching for the 1963 Charlotte Hornets in the South Atlantic League. Aside from Mary Elizabeth, survivors included his two sons, Michael and Robert; two daughters, Cindy and Kimberly; four stepchildren; and 18 grandchildren. This biography was reviewed by Tara Kriger and fact-checked by Kevin Larkin. In addition to the sources noted in this biography, the author also accessed Schroll's player file and player questionnaire from the National Baseball Hall of Fame, the Encyclopedia of Minor League Baseball, Retrosheet.org, Baseball-Reference.com, Rod Nelson of SABR's Scouts Committee, and the SABR Minor Leagues Database, accessed online at Baseball-Reference.com. Thanks to Tara Williamson, Reference Librarian at the Rapides Parish Library, Alexandria, Louisiana. Thanks to Mary Elizabeth Pace for discussing her life with Schroll in a telephone interview on January 30, 2017. Thanks, as well, to Mrs. John Schroll of Lake Charles, Louisiana, Al’s sister-in-law. 1 Charles Schroll’s catching career is unconfirmed, though contemporary sources during Al Schroll’s career referenced it. 2 Author interview with Mary Elizabeth Pace, Schroll’s second wife, on January 30, 2017. Schroll was often listed as “I. E. Schroll” in newspapers of the day, and the initials were even mentioned in his Town Talk obituary. 3 Al Schroll player questionnaire at the National Baseball Hall of Fame. 4 Football data courtesy of pro-football-reference.com; no data are currently available regarding Bill Schroll’s statistics with Green Bay. 5 “North Siders Blanked By Minden Ace,” Arkansas Democrat (Little Rock), June 18, 1949: 6. 6 Associated Press, “Bolton’s Schroll Inks with Bosox,” Morning Advocate (Baton Rouge), July 7, 1950: 12. 7 Earle Hellen, “Six Former Patriot Stars Are Seeking Berths On Major League Teams In Spring Training,” Greensboro Record, March 2, 1955: 21. 8 Associated Press, “Schroll Rates Bouquets,” Arkansas Democrat (Little Rock), March 8, 1955: 16. 9 Tom Monahan, “Pitcher Al Schroll Sees Rosy Future,” Boston Traveler, March 20, 1956: 22. 10 Minarcin Signs, Five Holdouts Listed,” Boston Traveler, February 27, 1957: 36. Schroll was not one of the holdouts. 11 Bill Liston, “If Schroll’s Arm’s OK, Watch Out for His Bat,” Boston Traveler, March 14, 1957: 39. The story seems unlikely. Burns said Albany scored 11 times in the first inning, but his story would ascribe seven of the runs to Schroll, which would be impossible if he had been batting low in the order. The score, Burns said, was 18-0 after two innings. Such statistics as we have for the league indicate that Schroll hit two homers all year long, and had 14 RBIs. 12 Ed Rumill, “Al Schroll Joins Ranks of Sox Hitting Hurlers,” Christian Science Monitor, March 2, 1955: 11. 13 American League questionnaire, in Schroll’s player file at the National Baseball Hall of Fame. 14 Hy Hurwitz, “Cronin Cites Schroll, Stephens, Sisler, Keough, for Rosy Outlook,” Boston Globe, April 5, 1958: 13. 15 “Chico Carrasquel Sold to Orioles,” New York Times, October 3, 1958: 35. 16 John Drebinger, “Cubs Trade Bobby Thomson to Red Sox for Schroll, A Pitching Prospect,” New York Times, December 2, 1959: 59. 17 Mary Elizabeth Pace interview. 19 “Albert B. Schroll,” The Town Talk (Alexandria-Pineville, Louisiana), December 2, 1999: A4. 20 Mary Elizabeth Pace interview.